From left to right: LouAnn Mossler, Candace Pepin, Cathy Anderson and BJ Sylvester-Pellett. Janet Dunham and Barbara Combs are absent from the photo. 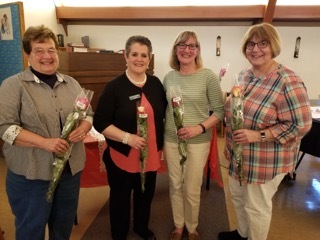 AUGUSTA — Maine-ly Harmony women’s barbershop chorus recently installed its officers. Serving the chorus are president Cathy Anderson of Jefferson; vice president BJ Sylvester-Pellett of Winthrop; secretary Candace Pepin of Augusta; treasurer Janet Dunham of Belgrade; and members at large, Barbara Combs of Topsham, and LouAnn Mossler of South China. Directed by Kathy Greason of Brunswick, the chorus members welcome singers to their Wednesday 6:30 p.m. rehearsals at Emmanuel Lutheran Episcopal Church, 209 Eastern Ave. in Augusta.